In Portuguese with English subtitles. Also known as Ill-Fated Love, Doomed Love, and Amor de Perdição: Memórias de uma Família. Note: There is an on-screen logo present throughout the film. Run time is 4 hours 20 minutes on 2 DVD's. This four-hour epic romance in the style of Romeo and Juliet is based on an 1862 novel by Portuguese writer Camilo Castelo Branco. Set in the seaside town of Oporto, the romantic tragedy centers on the doomed love affair between two teens; Teresa (Cristina Hauser) and her lover Simao (Antonio Sequeira Lopes) both come from highly-placed, aristocratic families. Their relationship is forbidden by their illustrious parents, who are competitive and antagonistic towards one another. Teresa's family orders her to marry her cousin, and from that moment onward, the stage is set for tragedy. 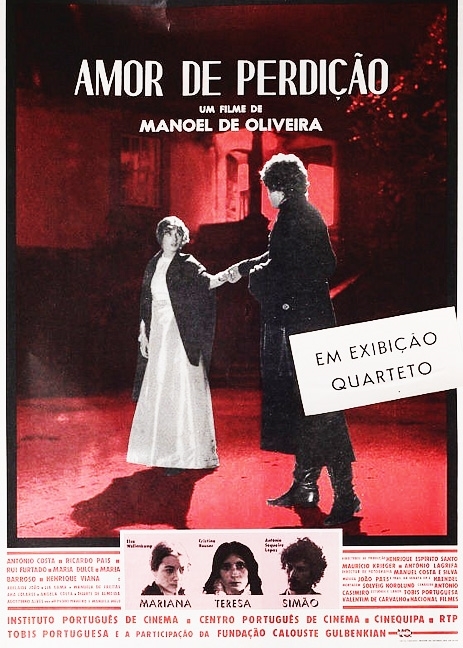 This is the fifth film from acclaimed Portuguese director Manoel de Oliveira.